ATA Brasil Airlines was a low cost airlines of Brazil with its base in Recife, Brazil. 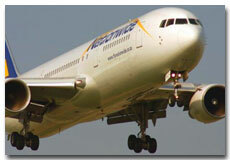 ATA Brasil provided scheduled air flight passenger services along with cargo service to several domestic destinations. ATA Brasil was founded in 2001. Initially the airline started operating its taxi services in Recife. It started its air flight operations in 2004.